The classic double blooms of 'Sarah Bernhardt' are deep pink, lighter toward the edges. This heirloom from 1906 is also delightfully fragrant, and one of the strongest growers and most reliable bloomers. No wonder it received the Royal Horticultural Society's Award of Garden Merit. Late midseason. Peonies produce their extravagant display in early June every year, regardless of weather, because they are among the most durable and longest-lived plants. They have no natural enemies, no exacting cultural requirements beyond full sun and neutral to slightly sweet soil, and they shrug off cold. After bloom is complete, you are left with a handsome mound of glossy, deep green foliage that will happily anchor the next sequence of bloom in the neighborhood. Finally, Peonies make superior cut flowers, lasting more than a week if cut in full bud. We ship large roots with 3–5 eyes that are fresh from the growing fields. While a newly planted Peony seldom makes a first-class show in its first season, these vigorous plants will reach the top of their form in their second or third year. Southern gardeners should seek out our early bloomers and provide afternoon shade. I planted several of these in front of my house, and the flowers are spectacular! They also bloom profusely, so I have to stake them well, since the flowers are so large. They're even more beautiful than I expected, and I would highly recommend these peonies for an amazing garden display, and for the most incredible cut flowers! When the first one bloomed I was amazed. Every day I would return to my sunroom to see how many more would surprise me. The flowering were so huge and the color- amazing! I have to order more!! Blooms profusely and reliably, but stems are annoyingly weak. I'll try a 36" tall cage next year. Even though I live in zone 8 this flower bloomed so great and has a beautiful fragrance. I am hoping that the blooms will be larger next year. this is my all time favorite peony. thank you. No garden is complete without these imposing plants, which are covered with sumptuous flowers in May and June. True perennials, Herbaceous Peonies may live for fifty years or so, becoming more impressive over time. Peonies are easy to grow and will reward you with armfuls of cut flowers and a splendid show in the garden. They make striking specimen plants, play nicely with other perennials in the garden, and are ideal for bordering a walk or driveway. Early-, mid- and late-blooming varieties are available to extend the flowering season, some of which are fragrant. Peonies are grown in Zones 3 to 8; in the South, they will flower in Alabama but the limit appears to be cooler areas of Zone 8. Southern gardeners should choose early-flowering singles for the best success. Light/Watering: Plant Herbaceous Peonies in full sun except in the South and the warmest parts of the West, where afternoon shade is appreciated and will help the flowers last longer on the plant. An inch of water a week throughout the growing season is recommended. Fertilizer/Soil and pH: Well-drained soil rich in organic matter is desirable. If your soil is extremely acid, add a few handfuls of lime at planting time. Plant the roots with the eyes (the pink or white buds at the top of the roots) pointing up and cover with one to two inches of soil in the North and no more than one inch in the South. (Please note: If the eyes are set deeper than recommended, plants may not bloom. For this reason, do not mulch over the crowns.) 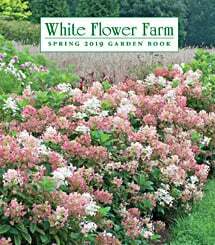 Don't be surprised if there are few or no flowers the first spring after planting; plants generally take a few years to settle in and bloom heavily. Peonies respond well to an annual sidedressing of one inch of compost or aged manure; no other fertilization is necessary. Many Peonies, certainly the double-flowered varieties, must be staked to prevent a thunderstorm from pushing their blooms into the mud. Set the supports in place as new growth begins to emerge in early spring. Pests/Diseases: Few insect pests bother Herbaceous Peonies, but a fungal disease called botrytis may be a problem, especially in very wet seasons. The stems of Peonies develop cankers or blacken at the base and fall over or simply wilt. Leaves may show black or brown patches and buds may turn brown and fail to open. Good culture and sanitation in the garden can help prevent or correct these problems. Plants need good drainage and air circulation, so do not crowd. Remove any affected foliage at the first sign of disease and deadhead religiously, removing all flower parts and petals from the garden. Cut off all foliage just below soil level after a killing frost in the fall and remove it and any debris from the area -- do not compost. If botrytis was present the previous spring, add a shallow layer of sand around the plants and crowns and spray newly emerging shoots with Bordeaux mix or lime sulfur following label directions. Fungal spores overwinter at the base of the plants, and spring rains then splash the spores up onto the new shoots. Removing any debris and old foliage and covering the soil with sand helps prevent reinfection. Another blight known as phytophthora may also appear, but the two diseases are hard to tell apart. Take a sample to your USDA Cooperative Extension Service agent or a specialist if you suspect phytophthora, as this disease is usually fatal to the plant and infected plants should be dug up and destroyed, and the soil replaced before replanting. Peonies can be susceptible to powdery mildew in summer. The white, powdery mildew fungus covers the leaves to varying degrees, but seems to have little effect on the vigor of the plant. This can be avoided or diminished by planting in full sun and providing ample air circulation around the plants. Cutting Flower Buds: To enjoy the blooms of Herbaceous Peonies later in the summer, cut the buds just before they open on stems about 6 inches long. Lightly wet the inside of a large, resealable plastic bag, and place the buds inside. Close the bag and place it in your refrigerator (not the freezer). Later take out the buds you need and float them in a shallow bowl of water. When bud is about ⅓ open, lift it, then cut the stem to 1½ inches long and refloat the bud. Companions: Peonies flower with Roses and Clematis and are lovely with many other perennials; be sure to leave room around the plants for air circulation. White-flowered Peonies are entrancing against a background of evergreens. Spring-flowering bulbs such as Crocus vernus or Scilla siberica create a pleasing color contrast at the feet of emerging Herbaceous Peonies stems, which are often reddish. Reflowering: Many varieties make several side buds that will open after the terminal bloom flowers, so deadheading is beneficial. After each flower is finished, cut the stem underneath the old bloom, leaving the foliage alone. If exhibition-sized flowers are desired, remove the side buds as they form and leave only the terminal bud. 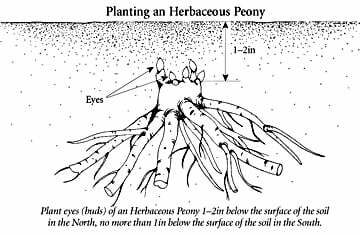 Dividing/Transplanting: Generally Herbaceous Peonies do not need dividing and some resent it. However, if you must move an established plant you need to divide it before replanting. Do this in the fall, after all foliage has died back completely. Each division should have three to five eyes, and it will usually take a couple of years for the new plants to flower. End-of-Season Care: Foliage of Herbaceous Peonies should be cut back in the fall and removed from the premises to discourage overwintering of pests. Mulch new plants with evergreen boughs or salt marsh hay after the ground freezes. Early Spring: Water plantings well if spring rains don't do it for you. Side dress plants with compost or aged manure. If botrytis blight was present the previous season, cover ground around plant with a thin (one-quarter inch) layer of sand and spray new shoots with Bordeaux mix or lime sulphur. Set stakes or other supports in place now. Mid-Spring: Watch for signs of botrytis blight and treat as needed, removing any diseased tissue immediately. Train through plant supports as plants grow. Remove side buds if exhibition-size blooms are desired. Late Spring: Deadhead Peonies religiously and remove all fallen petals or blooms from the garden. Summer: Herbaceous Peonies do best with an inch of water a week. Fall: Cut stems of Herbaceous Peonies back to soil level and remove from the area. Dig and divide plants now if necessary. Mulch new plantings with evergreen boughs or salt marsh hay after the ground freezes.